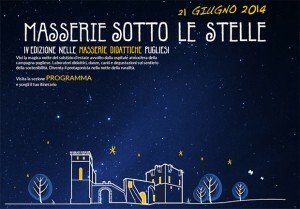 Returning for its fourth year in succession, this summer event allows visitors to get to know more about the Pugliese rural tradition by spending a notte bianca in a masseria – or even more than one. The phrase notte bianca (white night) basically means a night-long series of events and is often used by towns and cities to bring in the crowds and showcase local events, usually in the summer. This event involves masserie and traditional rural buildings throughout Puglia, including some wonderful old historic masserie in Salento. Visitors will be treated to a night of workshops, dances, songs, wine and food tastings and even accompanied nature rambles, all with the purpose of teaching people more about life in the Puglia countryside. Where: Throughout Puglia. The masserie in Lecce are listed here.